This is a simple sauce that tastes creamy and luxurious without using heavy cream – highlighting the natural flavor of some of the seasons’ finest wild mushrooms. You can use any kind of chanterelle or craterellus mushroom for this, but the sauce is at its’ best and most pleasing to the eye when a mix of different, colorful mushrooms is used. 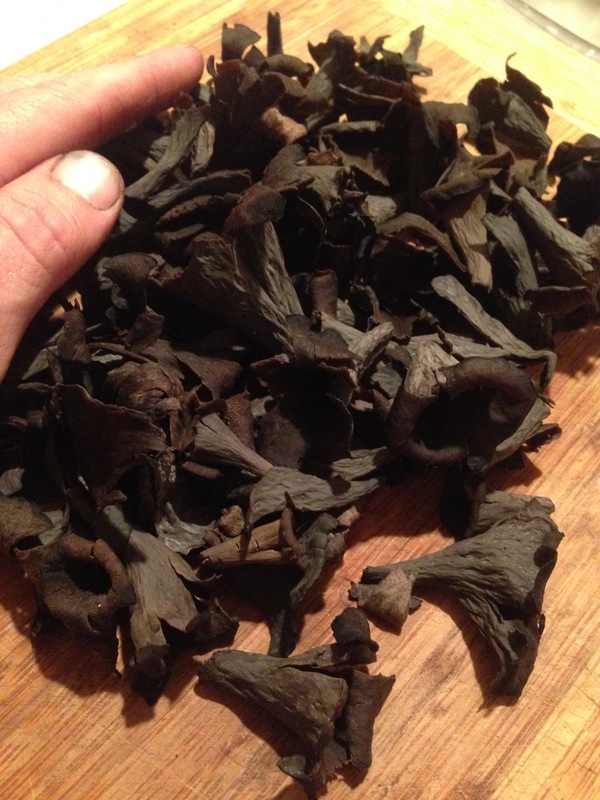 In the variation pictured above we used black trumpets (Craterellus cornucopioides) and golden chanterelles (Cantharellus cibarius). As always, prepare everything in advance and have handy when making a sauce so you aren’t rushing around chopping shallots or looking for sour cream when the time comes to add it. 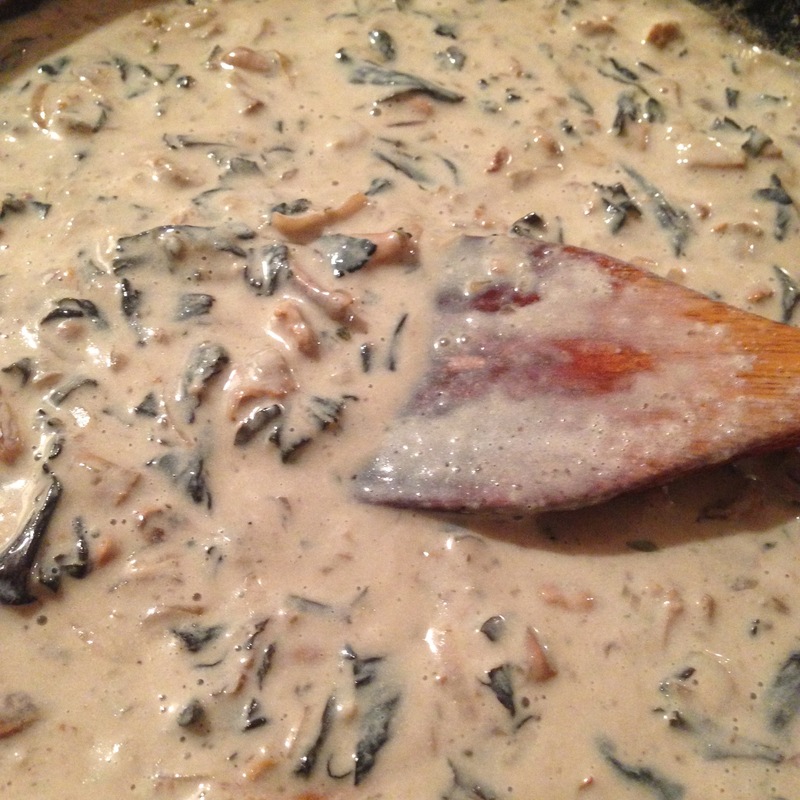 NB >>> Different mushrooms will cook at different times, so if using a mix, they should be added one at a time. I usually find that golden chanterelles take the longest and horn of plenty the shortest. Taste and adjust for seasoning. Serve immediately. If not eating immediately, allow the sauce to cool on its’ own without adding the sour cream. When serving, reheat and then stir the sour cream in, with chives if desired. There are of course any number of herbs or other seasonings that could be added to this sauce, but in this its’ simplest form I’ve used only the classic mushroom herb thyme and a bit of nutmeg and optionally pepper. Fresh parsley or celery leaf in small, finely-chopped quantities are a nice addition for a bit more green color. One could add a stronger herb as well such as oregano or tarragon if it seems appropriate for the dish it is to be used with. The temptation with a sauce this rich is to toss pasta in it, and revel in the sumptuous texture combination of chanterelle and toothsome starch. And I won’t deny that it is a fine sauce to serve with a starch – heavenly with freshly-made egg noodles, homemade biscuits (a nice vegetarian replacement for Southern-style sausage gravy), even simple buttered rice. Some more interesting uses? A cream sauce for greens or a green vegetable, a base sauce for a pizza, on top of heated stuffed vegetables or grape leaves, especially ones filled with rice or grains, on top of a hearty bowl of cooked, mashed lentils or pulses, and a dynamite partner with polenta. I have even eaten this on top of some scrambled eggs with a bit of cheese and green herbs and had no complaints about the experience. Makes a little over 2 cups of sauce. 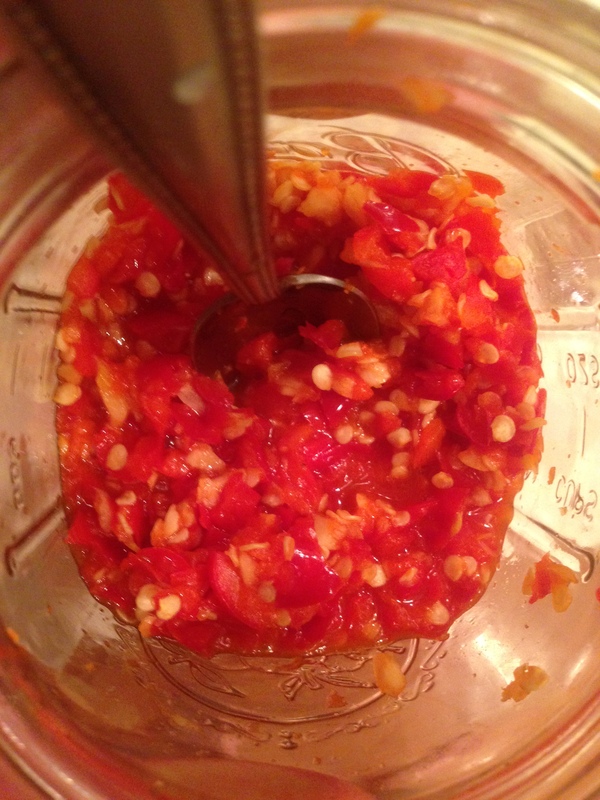 This is one of the easiest and tastiest tomato sauces you can make. It can be made with fresh tomatoes, but I usually make it in the winter months using high-quality canned tomatoes. This recipe is entirely based on long and slowly evolving use of Marcella Hazan’s “Tomato Sauce with Butter and Onion” (see notes at end of recipe). Gather your tomatoes. If you use fresh tomatoes, use about 2 lbs of a sauce-type tomato and remove the peels by whatever fashion you normally would. If you use canned tomatoes, use 2 cups or so (a regular large 35 oz can) and strain the fruits from the juice. Squeeze or cut each of the tomatoes and push out the juice inside them as well. ALTERNATIVELY, whether you go fresh or canned, you can pass the tomatoes through the food mill before cooking. I find that the flavor is superior if the fruits are cooked a bit seperately, and while still mostly whole. It can always be pureed later. In a small saucepan over medium heat, place a small knob of butter (2 tbs or perhaps a bit more) and a splash of olive oil (1-2 tbs). You can put a bit less or a bit more, but if you don’t use at least 3 tbs or so the sauce won’t be as rich. You may of course replace the butter with a substitute or simply use more oil. I have prepared this recipe just with oil. It is good, but not quite the same. A butter substitute appropriate to your diet would be a better replacement to create the proper creaminess. Add a half an onion or a small whole onion sliced in half. Add as in the picture above, in one large piece, not chopped or sliced. Add a few pinches of salt and a few grinds of pepper. You may also wish to add other things at this point, such as a few whole cloves of garlic or bay leaves other whole herbs or celery leaves or chiles sliced in half. Whatever you add, keep it in a large enough chunk to remove with ease. The idea is to bring the flavors out through slow cooking and permeate the sauce with them. 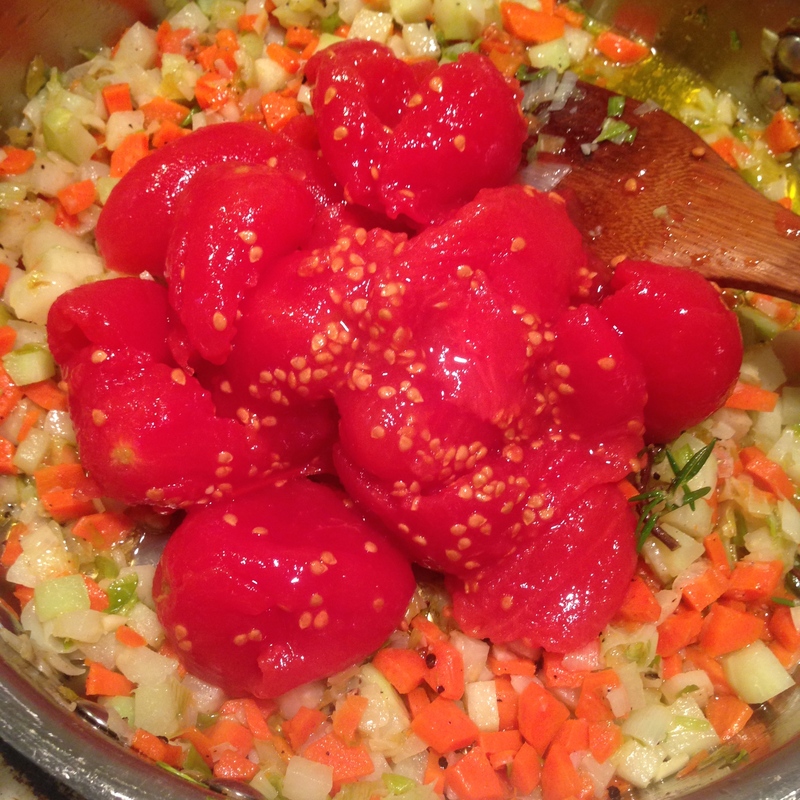 Immediately add the whole, drained tomatoes (whether fresh or canned, separate the juice). Sautée the whole tomatoes along with the butter, oil, onion and additional flavorings, slowly crushing the tomatoes them with a heavy wooden spoon or spatula, breaking them up and stirring while the mixture comes to heat. 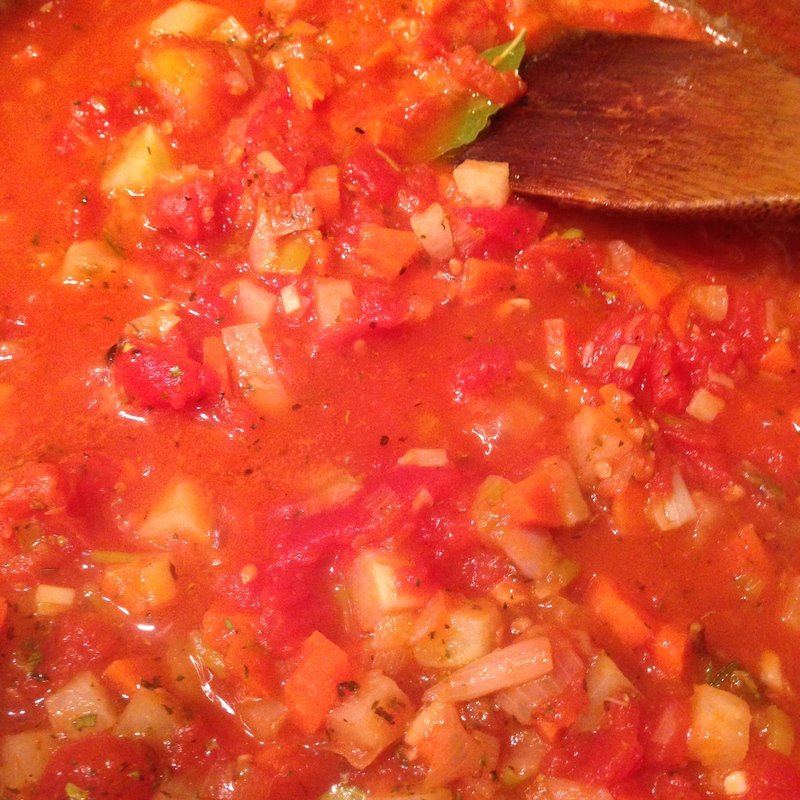 Cook the tomatoes and the aromatics together for five minutes or longer. Add the reserved juice from the tomatoes. 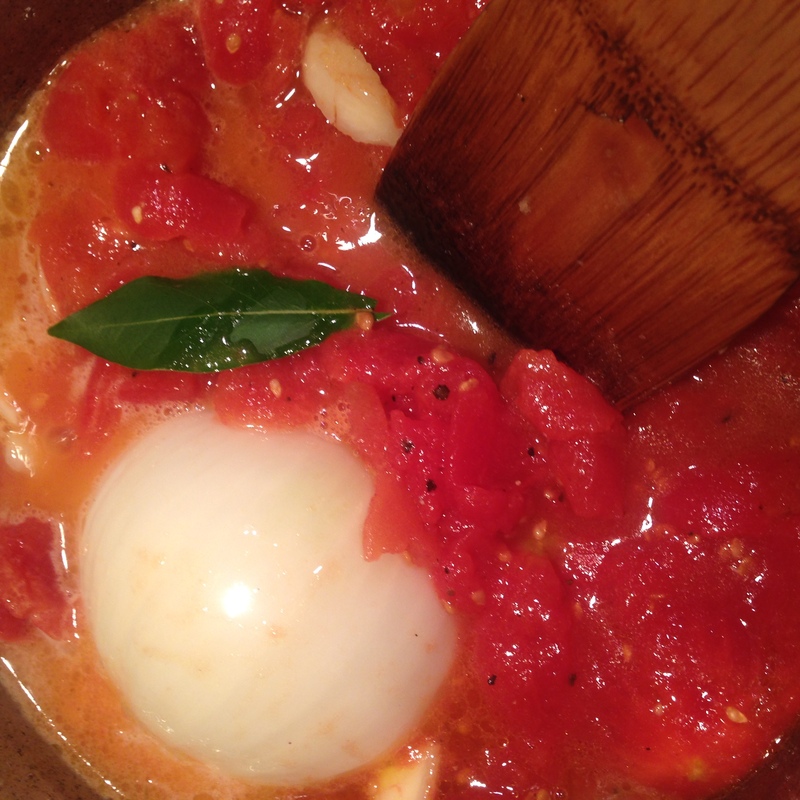 If you are using pre-prepared tomatoes, simply omit the sautée step. Bring the saucepan to a slow simmer, bubbling occasionally. Think a classic Sunday Sauce, only on a much smaller (and quicker) scale. The longer you cook this and the lower the heat, the more flavorful it will be. It benefits from sitting overnight as well, but I can never resist it when freshly made. I usually find it takes about 45 minutes to an hour of simmering before the oil rises to the top and the juices have boiled down to a nice thick sauce. This is not a marinara-type consistency but a thick, chunky tomato sauce. It should be rich and creamy and look almost like a vodka sauce. If the sauce is to be pureed, it can be served with thin spaghetti and the like, but I prefer to keep it somewhat chunky and put it on a thicker cut of box pasta, like the rigatoni below. It is also excellent (a la Hazan) with potato gnocchi, and many stuffed pastas with ingredients such as squash, pumpkins, mushrooms, nuts and bitter greens. You may add cheese or choose not too–I usually find that the sauce is rich enough and enjoy instead a sprinkle of oregano or marjoram. Likewise, I find that served with cheese stuffed pasta the cheese should be sharp and pungent rather than mellow like ricotta or mozarella, or the result will be bland. It’s also excellent served with stuffed vegetables or as a sauce to zest up a simple vegetable dish or bowl of lentils. This is an extremely basic slow food recipe, but one that I hope you will find useful as well as endlessly variable. I had to look all this up not only to make clear my thievery, but because while I have been making this sauce since the late 90’s I don’t ever really actually look at the recipe. Once I had looked at them both I realized that I’d been making it unlike Marcella for many years. She must have made that same realization when she selected recipes for Essentials, the latter version being much lighter on butter and omitting sugar (!) entirely. 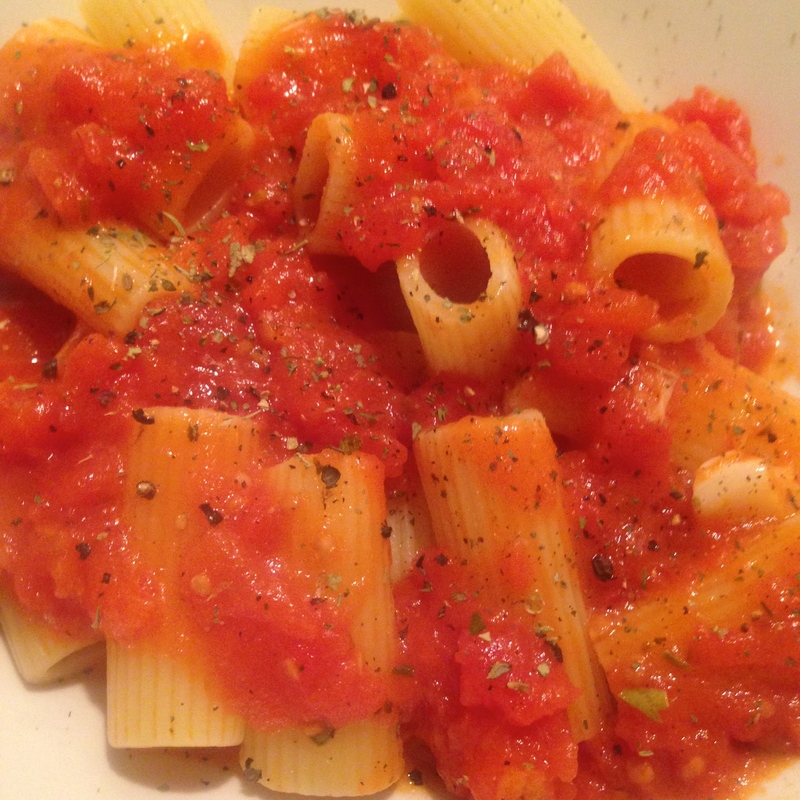 Her version is made with fresh tomatoes, too, while for an unknown reason at some point long ago I began to make this sauce exclusively in the cooler months and good canned tomatoes. If there is a cookbook writer to be recommended any more highly than Marcella Hazan, I can’t think of one. Even if you aren’t particularly drawn to Italian food, her description of cooking technique is unsurpassed. Always explained in the same authoritative, thorough and patient tone. Almost everything I make is an experiment, I rarely prepare the same exact dish twice. Many of my (hah!) canonical dishes are ruthlessly tweaked from Marcella’s master tapes.